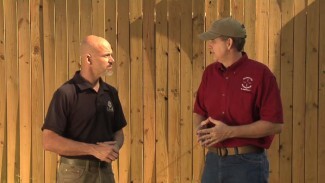 The hows and whys of effective shooting on the move are examined in the latest handgun training session with defensive shooter Rob Pincus of PDN and competition shooter Rob Leatham of Team Springfield. In competition, the two elements that determine a score are speed and accuracy. Targets are often shot on the move to save time. A competitor doesn’t shoot on the move to gain accuracy, because it doesn’t do that. If Rob has to shoot two targets that are not next to each other, he moves to get closer to each one. The sequence he advocates is: move — draw — shoot first target — move to target two — shoot. 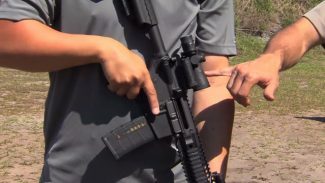 The keys to accurate shooting on the move are good shoulder position, good arm extension, put the sights on the target, and pull the trigger without moving. Pincus replies that this sounds like standing and shooting, and Leatham agrees. The type of footwork employed is unimportant — just don’t bob while moving during any shooting drills. Why move while shooting in a competition? Because you can see where the targets are and moving gets you closer to them. 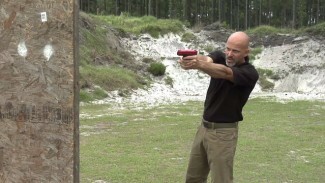 Leatham coaches Pincus to take two shots each at the two targets while moving. 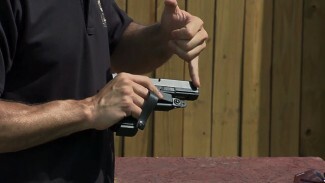 Leatham advises him to stabilize the gun — make the gun stop moving before his body stops. The result? Four solid hits. Shooting on the move in a defensive situation is compelled by the specifics of each situation, for example needing to reach a family member. The mechanics are the same as competition shooters use: move — draw — shoot. Use the downtime of the draw to gain ground. The two Robs conclude that the mechanics of shooting on the move for competition and defensive shooters are very similar, though competition shooters move to save time, while defensive shooters move to gain position. These video’s are extremely important & interesting.